Provide comfort for the family of Gertrude Lindsay with a meaningful gesture of sympathy. Beloved wife and mother, Gertrude A. Lindsay, age 91, passed away on Tuesday, February 19, 2019, at Mountain View Hospital in Las Cruces, NM with her loving daughter Catherine by her side. She was born on July 28, 1927, in Flint, MI. She grew up in Croswell, Michigan, with her brother Richard Holewinski. She met and married her husband Ralph Lindsay in Detroit, Michigan and were devoted to each other for 69 years until his death in 2017. The family moved to Las Cruces in 1982 where Ralph and Gertrude enjoyed many years together as retirees. Gertrude was a devoted wife and mother, who enjoyed gardening, sewing and spending time with her family and friends. She impressed many people with her quiet strength in the face of pain. She moved into Desert Peaks Assisted Living in August 2018. While there she enjoyed an occasional bingo game and shopping trips. 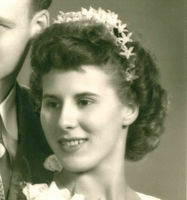 Gertrude is preceded in death by her husband Ralph, parents, and her brother Richard Holewinski. She is survived by her daughter Catherine Lindsay. Gathering of friends to be held at 2 pm, Tuesday, March 12, 2019 at Getz Funeral Home. Graveside service will be held at 2:30 pm, Wednesday, March 13, 2019 at Fort Bliss National Cemetery. To send flowers in memory of Gertrude Ann Lindsay (Holewinski), please visit our Heartfelt Sympathies Store.